Imagine yourself on Christmas morning. You and your family are gathered around the tree, exchanging gifts. Michael Buble’s latest album softly plays over the gentle crackle of a glowing fireplace. It’s your turn to open up a present, and you find yourself in an awkward position as you unwrap the same gift you were given not too long ago by your well intentioned uncle. Sure, it’s got a few new bells and whistles, but you basically already had it. But you smile and say, “thank you,” because having an update to something that worked just fine isn’t the worst thing in the world. This is essentially how you might feel after seeing Illumination’s animated retelling of the classic Dr. Seuss story, HOW THE GRINCH STOLE CHRISTMAS, simply titled THE GRINCH. Most of you likely already know the story, but THE GRINCH takes place in the fantastical world of Whoville, inhabited by furry humanoid holiday-obsessed folk known simply as the Whos. Christmas time is clearly the most important time of the year for the Whos, all except for one known only as the Grinch (voiced by Benedict Cumberbatch), clad in lime green fur and a perpetual scowl. The Grinch lives alone outside of Whoville and simply cannot stand Christmas time in the least. Audiences who remember the 2000 Jim Carrey version may be pleased to know this new animated reboot feels far less campy than its live-action predecessor. The visual style of Dr. Seuss simply feels right at home in the world of animation. The artists at Illumination are slowly starting to establish themselves as real contenders to compete with the likes of Disney and Dreamworks. Every image is stuffed with detail and creativity, making this film a simply delightful time at the movies. The Grinch (voiced by Benedict Cumberbatch) with his dog Max. Courtesy of Universal Pictures. Cumberbatch plays the titular holiday grump with relative ease, but still leaves something to be desired. Having provided the voice for the terrifying dragon, Smaug, in Peter Jackson’s THE HOBBIT trilogy, one couldn’t be blamed for wishing there was a bit more gruff sounding voice for the Grinch. However, this is not the only aspect of the character audiences may find feeling a little off. 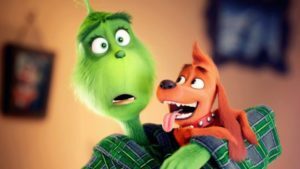 For a character described as having a heart that is “three sizes too small,” Cumberbatch’s Grinch is surprisingly compassionate throughout the film. His relationship with his adorably loyal dog, Max, is sweeter than sugar plums. He is still particularly selfish and overbearing to his faithful companion, but I counted multiple instances where Grinch would apologize to Max for his behavior. There’s genuine love shared between the two of them, and while that’s perfectly fine, it can’t help but feel contrarian to the point of the story. In this version, Grinch doesn’t really hate Christmas or what it stands for. He just hates that he’s been left out of all the fun for so long. Yet, oddly enough, new characters like Bricklebaum (Kenan Thompson) repeatedly attempt to be friendly with Grinch and try to get him involved in the festivities. So, when he inevitably does decide to spend Christmas day with the Whos, it feels as though the only one stopping him in the first place was himself. This could be an attempt to delve into deeper, very real issues like depression and self-imposed isolation, but it likely would have worked better for the film if it did more than simply scratch the surface. 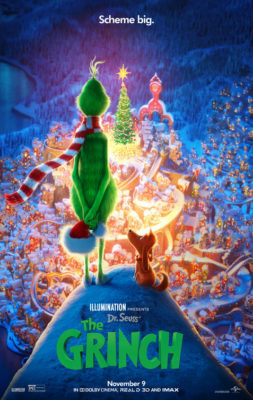 The secondary storyline in the film focuses on Cindy Lou Who (Cameron Seely) and her obsession with capturing Santa Claus on Christmas Eve, so she can ask him to help her hard-working single mother (Rashida Jones) have a happier life. It’s a nice intention, but this side plot eventually feels overplayed and stretched by the time she enlists her multiple friends to help her, accomplish her goal by being barely involved in any way. These little details certainly don’t ruin the film, but they do make it feel like it plays things a little too safe. But in the end, this animated rendition may just go on to age better than other versions, even if it does feature a few too many pop culture references for my taste. That being said, the dozens of young children in the theater were clearly having a great time. So, perhaps I should be a little less of a Grinch myself. THE GRINCH opens nationwide on Friday (11/9).